IE Business School start-up seeks to connect family owned firms in emerging markets with freelance consultants. A start-up launched by IE Business School MBAs is addressing the family business segment that the founders say has been neglected by top management consultancy firms. Pushing the sharing economy, and utilizing digital technology, bhive is an online marketplace that connects family-owned firms in developing markets with MBAs, who carry out freelance consulting work for a fee, often working remotely. Bhive takes a 15% cut on fees paid to the consultant, which can be as much as $200 an hour. 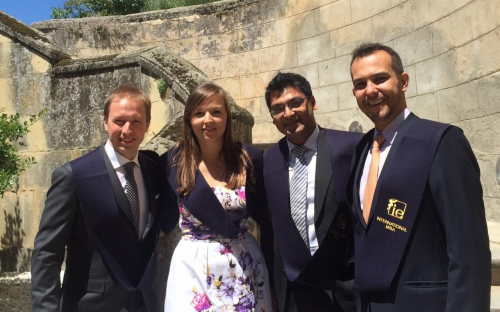 Initially a group project at IE in Madrid, the company was eventually founded by Alexander Afanasyev, Leonardo Marchant and Adriana Peceño, all IE MBAs. So far, bhive has signed up 70 consultants from top business schools including Harvard, INSEAD, IESE, Columbia and Stanford. However, the market is competitive. Bhive is competing with established “rent-an-MBA” websites such as HourlyNerd, MBA&Co and Skillbridge. In this interview with BusinessBecause, Alexander, chief financial officer, explains the benefits of an MBA, such as a strong network and being prepared to adapt to change. Bhive is incubated at Area 31, IE’s start-up ecosystem. Alexander balances bhive with a private banking associate post at Credit Suisse, the Swiss bank. Before beginning the MBA, he founded YDCollective, a design and architecture start-up, in Moscow. Why have you chosen to focus on just family-owned businesses — limiting your market — and what challenges have you faced in finding clients? I would not say that we are “limiting” our market. In Latin America, for example, family-owned businesses are the main form of company. We have started receiving inquiries from non-family-owned companies as well. These [family-owned] organizations have not changed much since their origination, though. They still face unique problems. Due to some entrenched, long-matured internal operations, it is probably one of the hardest business forms to penetrate from outside. On top of that, our pilot group of family businesses from the LATAM region stated that they were “sick of being treated like leftovers” by big firms. We learned that when it comes to advising on some urgent business issues, many consulting firms put their family business clients on hold — or worse, deliver services that do not solve the problem. What is really appreciated is a customized approach, deep personal affection, step-by-step progression and, most importantly, giving the client control over the project. Why would a company choose you instead of an established consultancy firm? Only very rich companies can afford business consulting in the form it exists [in] these days. That model ignores the vast majority of medium and even some large companies. Our solution is to provide companies access to extremely qualified talent, but in a lean fashion, focusing on short-term projects and remote working. In other words, we stripped consulting of all its expensive accessories and focused on solving the clients’ problems, as cheaply and quickly as possible. How do you source your consultants and are relationships with business schools essential? Although the platform is open to all highly qualified professionals, we look to maintain special relations with educational institutions. Our relations with business schools are vital. MBA, PhD, MSc or MA — if a consultant holds one these [degrees] from a top-ranked school, and registers with their student email [address], we can upload the candidate’s profile onto the database almost immediately. What is the benefit to MBAs of doing freelance consulting work and what are they paid? Freelance is a growing trend. We target people who are in-between graduating from an MBA and landing their dream job. Working as a freelance consultant gives MBAs exposure to new companies, sharpens their skills, adds new experience to their professional record, and gives them competitive compensation. The hourly rates are defined by consultants themselves, and can range from anywhere between $10 to $200. However, the final compensation will adapt to the budget of each project, and those hourly rates — along with user reviews — end up becoming a reference for companies to see which consultants are a fit with them. The “rent-an-MBA” space is already competitive, with Skillbridge and HourlyNerd. Can you compete? Yes. The consulting industry is changing. It is becoming very valuable to receive a service without any attributable overheads. The shifting of the paradigm is not an event; it’s a process that has already started. Uber offers you are ride without you owning a car; Airbnb rents you a property without owning any land. Companies such as HourlyNerd, MBA&Co and Skillbridge had all foreseen it was coming and decided to act. On the client side, there is a strong regional aspect because the success of each project depends not only on the skills of the advisors, but also on their experience in certain markets. That is why we focus on developing markets, which we know well. What financial, practical or other support has Area 31 given you? The incubator does not provide any kind of monetary support, yet the exposure to venture capitalists and investors, technical support, online services and mentorship is second to none. We were given a chance to work side-by-side with entrepreneurs from around the world, participate in different competitions and venture days, and get continuous feedback from serial entrepreneurs. I believe that the support we got from that start-up ecosystem was crucial to our success. People question the value of an MBA for entrepreneurs. How has an MBA been of benefit to you? The value of an MBA is the business network and the ability to quickly restructure one’s way of thinking and adapt to new circumstances. Being an entrepreneur means not only being flexible; it also means being capable of facing challenges and pivoting your business model all the time. This is what I would not have been able to embrace if it had not been for the MBA.